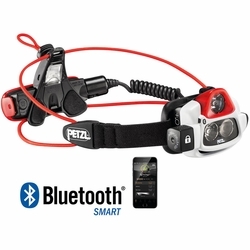 Petzl NAO+ Headlamp. Ultra-powerful, multi-beam, rechargeable headlamp that is connected, thanks to the MyPetzl Light app. It features REACTIVE LIGHTING technology, which automatically adjusts brightness to the needs of the user. With 750 lumens of power, NAO + sets the standard for challenging night activities! Connected and intelligent, it is entirely devoted to performance. Thanks to the MyPetzl Light mobile app, the athlete can in real time consult his smart phone or tablet to get remaining battery life and adjust headlamp performance. He simply downloads the profiles provided or creates his own personalized ones. During activity, with REACTIVE LIGHTING technology, NAO + analyzes ambient light and instantly adjusts the brightness to the needs of the athlete. With energy optimized and manipulations reduced to a minimum, the athlete can concentrate on the activity! Primary light source produces a multi-beam that works with a light sensor which controls REACTIVE LIGHTING. Customize lighting with the MyPetzl Light app. Compatible with smartphone or tablet. Negligible battery consumption thanks to Bluetooth� Smart. The lamp can still be used without the app.